Marble base with three black lacquered metal rods with bronze supports by leading the Italian design firm Stilnovo. 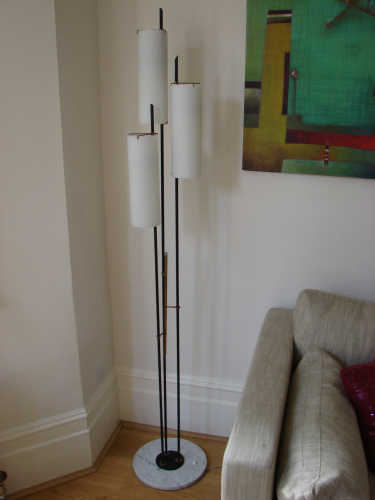 The 3 bulbs holders are covered by cylindrical opal glass which are held in place by original three-pronged bronze ties. The height of the glass cylinders are adjustable. In good condition. Italy 1950`s. The glass cylinders are 30cm by 10cm.